So here we are. 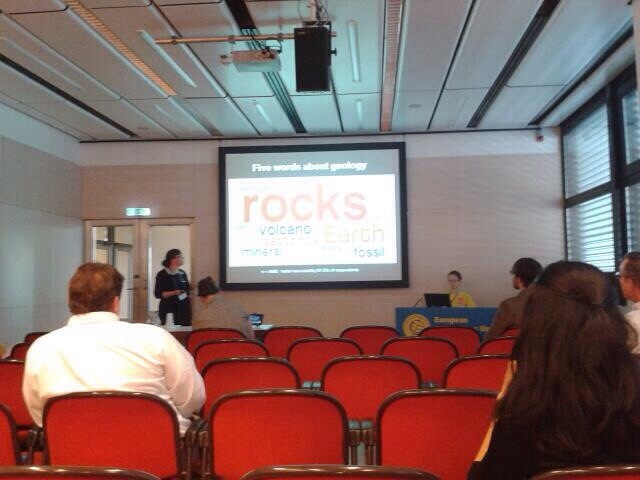 The final day at EGU and I’m about to present in my first international conference. To add to all that I actually have a pretty busy day as I have to be in Lyme Regis in Dorset this evening – so packing, catching the flight and driving for 3 hours back to Lyme were all also in my schedule today. 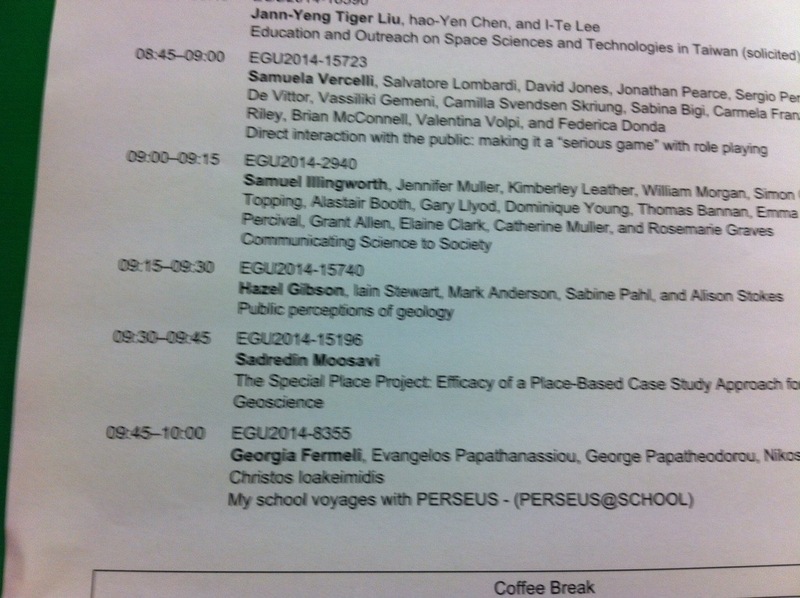 Nevertheless I appeared all ready for my talk at 8am this morning – and was welcomed by my name on the board! The session I was presenting in was called ‘Geoscience Education for Sustainable Development and Widening Participation‘ (EOS7) and was a mix of talks looking at geoscience communication and understanding from how to communicate your science, to using serious games to increase understanding about CO2 storage, to using place-based learning to help students engage with geology. Now I know I’m biased, but I thought the session was great – lots of interesting ideas and new concepts. My talk went pretty well I think – I always worry about speaking to an academic audience, especially when I’m an interdisciplinary. How many terms from cognitive science can I use without it being jargon? This is a highly educated audience after all! So I retreated into my preferred method of assuming some knowledge, but embroidering any terms with an accompanying image or explanation. I hope it worked!! In any case, after the initial terror faded I actually really enjoyed it (despite having to present after the dynamic and accessible presenting style of Sam Illingworth – gulp!). Hooray! The orals were followed by the poster session of the same name, and I went along to have a look at the posters presented. Again there was a huge variety, but one of my favourites was about ‘A New Protocol in La Spezia for Elementary and Secondary School Students for Monitoring Perception Towards Science and Performance in School Classrooms‘. I had a long talk with Mascha Stroobant and Silvia Merlino about their research and during this talk I couldn’t help thinking how it was really difficult to know what was happening in science perception studies in other countries as all our research is at such an early stage. There seemed to be no advanced or established research in science perception at EGU (that I could find, but I will kick myself if there was and I missed it), which makes it difficult to know what mistakes have been made before, how to avoid those pitfalls and the best methods for ensuring we have valid data. 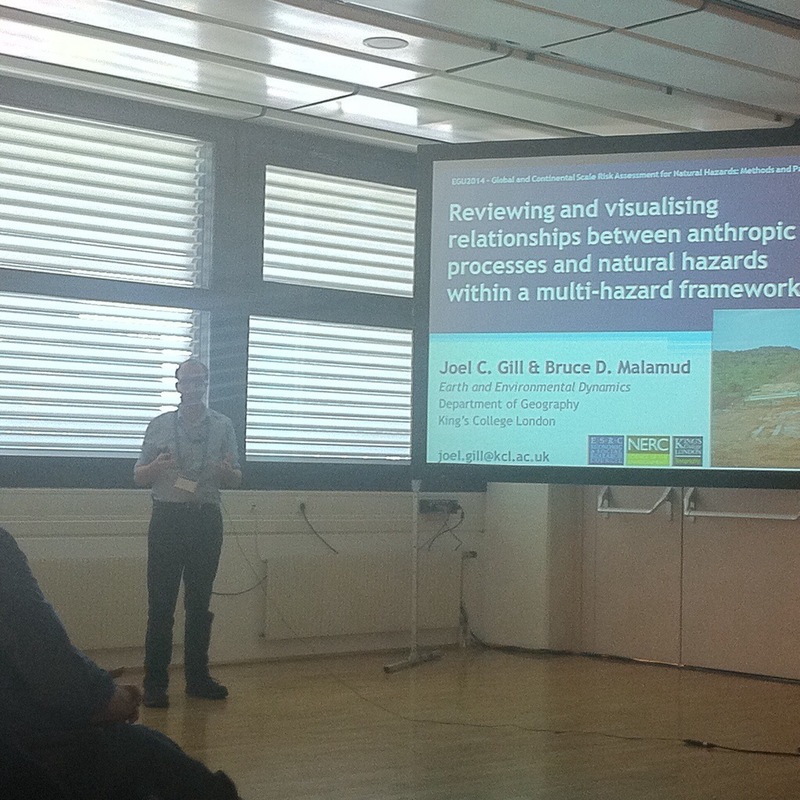 My final session of Friday (and of EGU) was ‘Global and Continental Scale Risk Assessment for Natural Hazards: Methods and Practice‘ (NH9.13). I could only go to half of this session and I wanted to go to support a friend who was presenting there – the brilliant Joel Gill, PhD student at Kings College London and founder/director of Geology for Global Development. He was presenting his work on ‘Reviewing and Visualising Relationships Between Anthropic Processes and Natural Hazards within a Multi-Hazard Framework‘. The brilliant thing about his research is that he presents risk within a continuum of natural and anthropic causes of hazard, not just in terms of vulnerability. 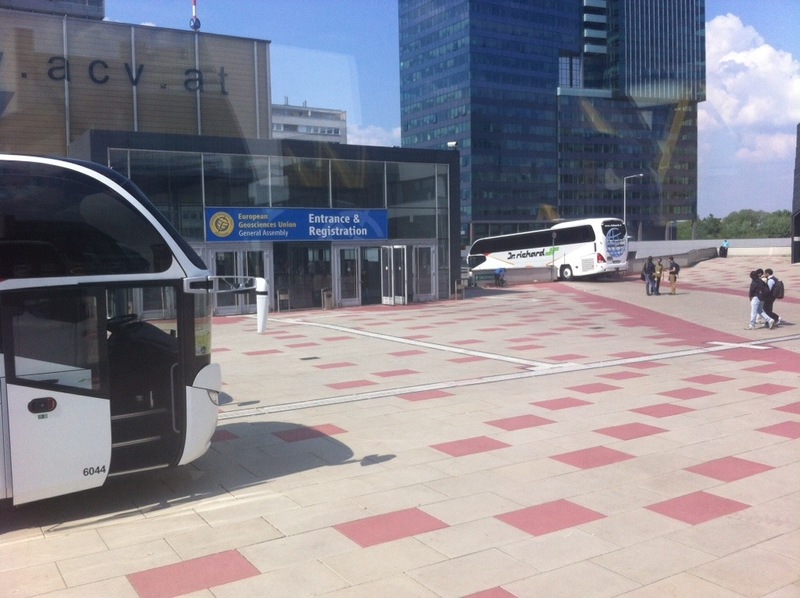 Unfortunately after Joel’s talk I had to dash off to catch the coach and so that was the end of my first EGU experience. I learned that geoscience is a much broader subject than I ever thought it was, and that people like myself in all varieties of interdisciplinary research are attempting to expand our understanding of the planet to new fronteirs. I learned that communication and public understanding of geology isn’t just important to industry, but to ALL geoscientists and even those working in narrow fields see the value of speaking about their research. I learned that I am part of a vibrant, enthusiastic and welcoming community, and all those things that I think I am alone in worrying about (because they are about interviews, psychology and data representation) are shared in different forms by many other reseracheres. I also learned that there is so much more to learn – and EGU just got me even more fired up to go back into the field and get back into my office – BRING ON THE DATA! !